Although condo numbers remain lower than last year’s numbers, the high-rise construction starts came in a robust 22 per cent higher in the major urban centres in May compared to April. CMHC’s numbers are supported by the latest Teranet-National Bank Composite House Price Index numbers from Wednesday, which shows single-family home prices rose 1.1 per cent in May – the ninth time in 15 years that May prices were up 1 per cent or more from the previous month of April. It is a vast improvement over 2012, up 2 per cent from last year’s rate which matched the April rate and marked the smallest 12-month gain since November 2009. CMHC’s standalone monthly SAAR was 200,178 units in May, an increase from 175,922 in April. The SAAR of urban starts increased by 14.6 per cent in May to 177,234 units, led by a 22.2 per cent rise in multiple urban starts to 114,346 units. Single urban starts increased by 3.0 per cent to 62,888 units in May. May’s seasonally adjusted annual rates of urban starts increased in Atlantic Canada and Ontario, and were essentially unchanged in the Prairies. Urban starts decreased in British Columbia and Quebec. Teranet’s numbers for B.C. housing prices reflected the same trend, as Victoria year-over-year numbers fell 4.1 per cent for May, and Vancouver dropped 3.2 per cent. 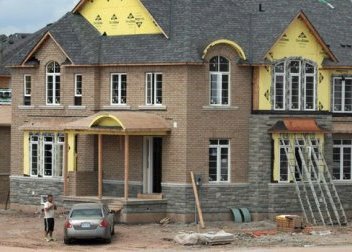 Housing starts in Canada were trending at 182,756 units in May compared to 182,971 in April, according to Canada Mortgage and Housing Corporation (CMHC). The trend is a six-month moving average of the monthly seasonally adjusted annual rates (SAAR) of housing starts. The numbers compared to last year’s Q1 are, to say the least, jaw-dropping. The totals overall for Canada show 205,237 starts for Q1 2012 compared to only 175,191 for the same first quarter this year. Although the Prairies and Atlantic Canada experience little change, Ontario was hit the hardest, dropping from 79,212 in 2012 to 56,391 for this year’s first quarter.